The F-Pace will resemble the C-X17 concept, seen here in Italian Racing Red at the 2014 Brussels auto show. DETROIT -- Jaguar's first crossover, the F-Pace, will be a rival to the Porsche Macan, the company says. The UK sports car brand released a teaser picture and some details of the model, which will be called the F-Pace, on Sunday at a press event here on the eve of the Detroit auto show. The F-Pace will join the Macan in the "sports crossover" market, Jaguar Land Rover North America boss Joe Eberhardt said at the event. The five-seat F-Pace was inspired by the brand's F-Type two-seat sports car. 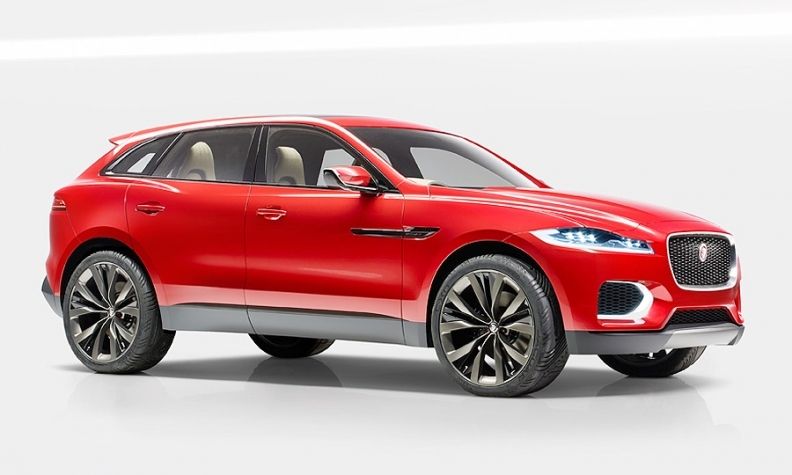 "The F-Pace is our family sports car," Jaguar Design Director Ian Callum said in a statement. 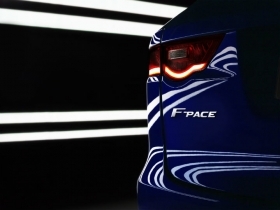 The F-Pace will take design cues the C-X17 concept that was first shown at the 2013 Frankfurt auto show. "Every surface will change, but it will still resemble the CX17," Callum said on Sunday. Jaguar Land Rover global sales director Andy Goss said the F-Pace is "squarely aimed at the North American market." The F-Pace will not appear at the Detroit show but will be fully unveiled later this year, Jaguar said, without providing more details. The crossover has now begun its engineering and development testing program ahead of its sales launch in global markets in 2016, the company said. The F-Pace will be built on Jaguar's new lightweight aluminum platform that also underpins the XE midsize sedan, its cheapest model, which will go on sale in Europe in May and in the U.S. a year later. The XE is a critical test of Jaguar’s ability to compete for entry-level luxury buyers after halting production of the X-Type last decade because of disappointing sales. In addition, the platform will underpin a replacement for the XF large premium model due later this year. When the three vehicles are on the road, four out of five cars in Jaguar's range will be less than 3 years old. Jaguar's teaser shot of the F-Pace. Jaguar withheld details of the F-Pace’s engine lineup and pricing. The SUV will be built on the same line as the XE in Jaguar Land Rover’s factory in Solihull, central England, creating 1,300 new jobs. The F-Pace will offer Jaguar's All-Surface Progress Control technology, which uses sensors to select the best throttle position and gear to maintain traction at low speeds on slippery surfaces. The model represents the next big step by Jaguar to grow from being a niche player in the luxury segment into a global premium contender. The brand has been re-invented to aggressively challenge top German rivals in key global segments. Jaguar's global sales rose 6 percent last year to 81,570 vehicles, parent Tata Motors said. Analysts expect sales to top 112,000 this year, helped by the new XE sedan. IHS Automotive forecasts that new models such as the XE, F-Pace and a compact SUV, which is expected to arrive in 2017, will push Jaguar's annual volume past 200,000 by 2018. Jaguar Land Rover is investing 3.5 billion pounds ($5.3 billion) in the year through March to broaden its lineup. The UK-based automaker contributed 81 percent of parent Tata’s revenue in the quarter ended Sept. 30. JLR is looking to boost demand with new models across Jaguar and Land Rover brands.